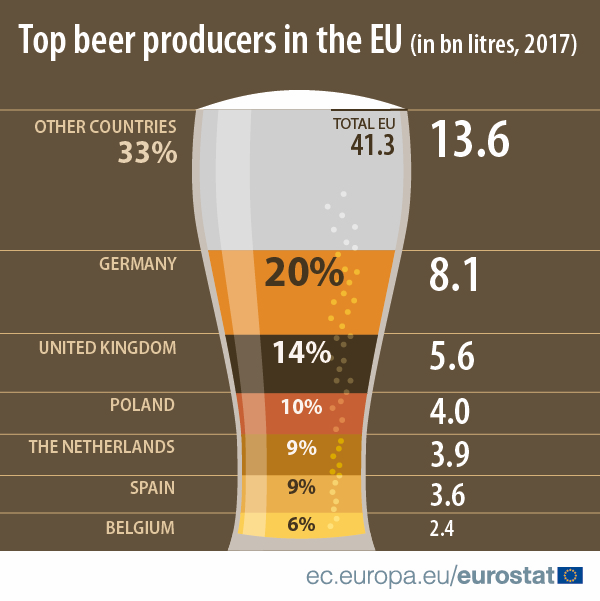 To mark World Beer Day on August 3rd, Eurostat reported that in 2017, over 41bn litres of beer containing alcohol were produced in the European Union (EU), 2.5bn litres more than in 2016. The EU’s beer production was equivalent to almost 81 litres per inhabitant. In addition, the EU produced nearly 900m litres (2%) of beer which contained less than 0.5% alcohol or had no alcohol content at all. There was no data, from Ireland. Two-thirds of the beer containing alcohol produced in the EU came from six member countries. Germany was the top producer in 2017 with a production of 8.1bn litres (or 20% of the EU total production). In other words, about one in every five beers containing alcohol produced in the EU originated from Germany. Germany was followed by the United Kingdom (5.6bn litres produced, or 14%), Poland (4.0bn litres, or 10%), the Netherlands (3.9bn litres, or 9%), Spain (3.6bn litres, or 9%) and Belgium (2.4bn litres or 6%). Compared with 2016, the Netherlands (+48%) recorded the highest increase in the production of beer containing alcohol, followed by the United Kingdom (+14%) and Portugal (+11%). In contrast, the production of beer in Greece fell by -9%, followed by Slovakia (-5%), Bulgaria and Lithuania (both - 4%). 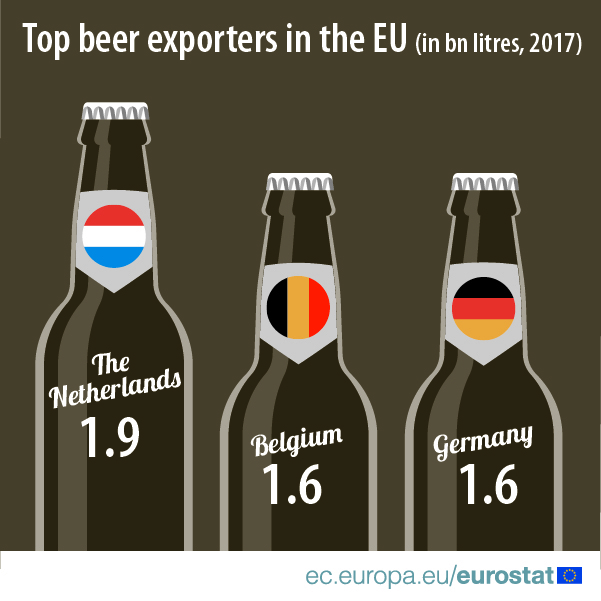 The Netherlands exported 1.9bn litres of beer containing alcohol in 2017. 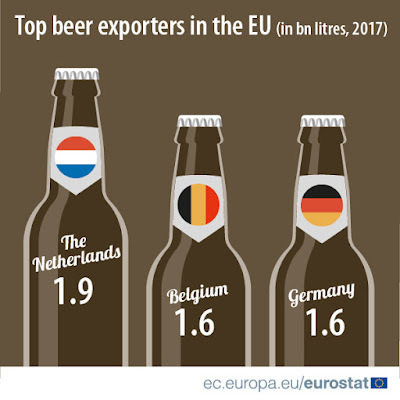 This made it the largest beer exporter of all EU member countries, ahead of Belgium and Germany (both 1.6bn litres), followed by France (0.7bn litres) and the United Kingdom (0.6bn litres). The United States was by far the main destination for beer exports to non-EU countries (1.1bn litres of beer containing alcohol exported there in 2017, or 31% of total extra-EU exports of beer). The United States was followed by China (520m litres, 15%), Canada (210m litres, 6%), Korea (175m litres, 5%), Russia (138m litres, 4%), Switzerland (111m litres, 3%), Australia (100m litres, 3%) and Taiwan (95m litres, 3%). The internal market for beers containing alcohol that are not produced in the EU is marginal. However, when importing from non EU-countries, EU member countries favoured Mexican beer (211m litres, or 52% of all extra-EU imports of beer in 2017), ahead of Serbian beer (48m litres, 12%), US beer (39m litres, 10%), Belarusian beer (23m litres, 6%), Chinese beer (16m litres, 4%), Ukrainian beer (11m litres, 3%), Russian beer (10m litres, 3%) and Thai beer (9m litres, 2%).